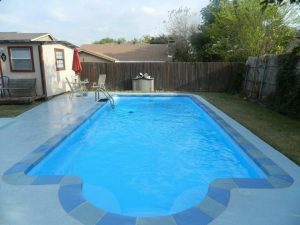 From South Congress to East Austin, the team at Texas Fiberglass Pools Inc. keeps swimming pools and spas throughout Austin looking their best with quality Austin fiberglass pool repair, fiberglass pool resurfacing and an array of additional services. Our goal is to ensure that you get the most from your pool without worrying about unsightly flaws, mishaps, and breakdowns. A well-designed swimming pool or spa offers hours of fun and enjoyment but requires regular care to keep it operating safely and efficiently. Texas Fiberglass Pools Inc. provides complete pool maintenance services, so that your pool lasts longer and continues to look great for many years to come. We perform waterfall, water feature, and baptistery resurfacing and repairs in Austin as well. Whether you need deck resurfacing to prevent accidental trips and slips, a quick pool repair for a leak or a new plumbing installation, the pros at Texas Fiberglass Pools Inc. are equipped to handle any job. One of our favorite ways to bring a natural but sophisticated grace to our Austin residents’ poolside retreats is with a custom flagstone patio or walkways. A flagstone walkway or patio is a relatively inexpensive and easy-to-install option for creating a decorative and functional walking space. Flagstone can be surrounded with grass, flowers, or small decorative rocks to enhance your environment. We install flagstone walkways and flagstone patios in both residential and commercial establishments. Few pleasures in Austin compare to the relaxation and rejuvenation that people enjoy in their own beautifully resurfaced swimming pools or hot tubs. The expertise and experience of the team of contractors at Texas Fiberglass Pools Inc. ensures skilled execution with quality results. Call Texas Fiberglass Pools Inc. today for all of your pool repair, resurfacing, and renovation needs.